Aussie Natural Branded Drink Bottle! 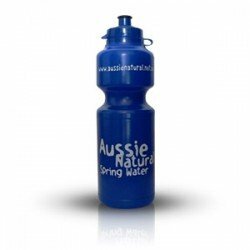 For ultimate ease and convenience, Aussie Natural also offers our customers our water drink bottle. Deep blue and branded for Aussie Natural, our drinking water bottle means that you can reuse your bottle, with a lid designed to be removed, refilled, and replaced. Tailored grips make your water drink bottles perfect to grab and go with, whether to a sports game, school, work, or anywhere you want to ensure you’re completely hydrated.